A loan of $925 helped a member to buy cost efficient maize seeds and fertilizer for the coming harvesting season. Dolorosa is 65 years old and has 9 children. She has been a farmer for more than 40 years and is always said to be a very trustworthy person. 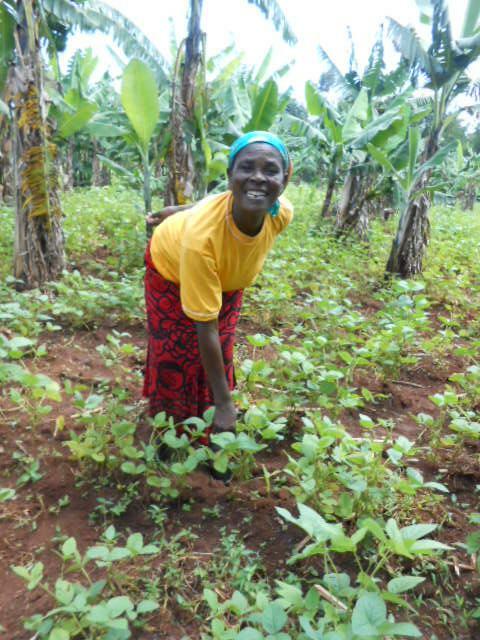 Even though Dolorosa is the only one featured in the above picture, she is actually representing her group formed by 15 farmers in Webuye District, Kenya. Dolorosa started working alongside One Acre Fund a few years ago, in 2012, and decided to do so because she wanted to earn enough to feed her family. Since then, she has seen her life improve; especially in the sense that she has had more profits from each harvest ever since. This year she decided to represent her group because she wanted to help more farmers. Dolorosa’s Group will receive farming inputs to plant a total of 8 acres of land. Additionally, some of the farmers in the group will be purchasing a solar light so, with this loan, the group will also receive a total of 5 solar lights. It supports smallholder farmers to purchase seeds and solar lanterns.